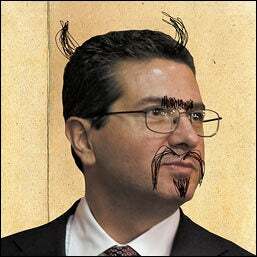 Here's your daily link to Dave McKenna's brilliant "Cranky Redskins Fan's Guide to Dan Snyder," which we'll be posting until Snyder's dumbass libel suit chokes to death on vanilla ice cream. Today's topic: Bathroom beer sales. Selling beer at the stadium, well, that's encouraged. Mandatory, too. And profitable, of course. Selling beer in the stadium bathrooms, well, that's just odd. Unhealthy, too. But still profitable, of course. In 2008, a photo of said action trickled out of FedExField and onto the official Redskins message board, ExtremeSkins.com. The next year, a YouTube video surfaced. That's when the issue was taken to Barbara Hyde, spokeswoman for the American Society of Microbiology for comment. "A bathroom can be hazardous to your health, particularly as guys, since the track record for guys is, after they urinate, they're quite disinclined to wash their hands. You pick up things from all over in the bathroom. When they hear this, some guys say, ‘I don't think my hands are contaminated.' Well, they might not be picking anything up from the act of urinating, but you may be carrying around bacteria and viruses from other sources. Even without the science, frankly, I'm surprised anybody would be considering mixing any type of food or beverage with the bathroom setting." After the video hit, a team spokesperson they don't tolerate such sales pitches and had identified the vendor against whom "appropriate action was taken."